Take a look at these dental solutions that will help you avoid problems with your teeth and will maintain your oral health impeccable. Regular visits to the dentist, as well as cleaning and mouth rinses are fundamental healthy habits and the necessary dental solutions to have good dental health and avoid complications. 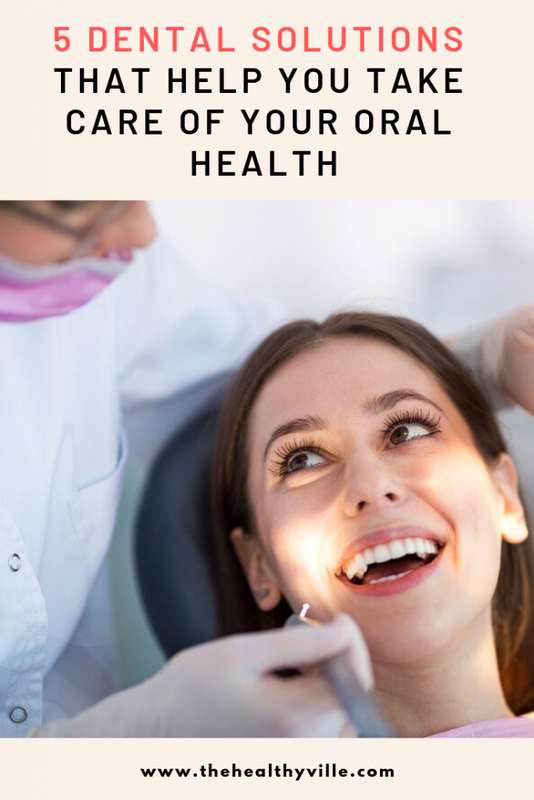 A healthy smile is the desire of every person who cares.These five habits that will help you take care of your dental health prevent problems of teeth and gums. In addition, they will give you an excellent image. Good denture requires perseverance. Hygiene implies a series of care that goes from a proper brushing to the use of dental floss and mouth rinses. It is a daily task that you cannot neglect without risking serious illnesses. The most well-known oral diseases are caries, gingivitis and periodontitis. Also broken or darkened teeth, oral candidiasis, bruxism, mouth sores and even cancer. All have devastating effects on teeth, gums and on the tongue; it is necessary to remedy in time to avoid greater evils. Caries appears due to the lack of proper hygiene, and affects one in four adults. This type of dental pathologies cause pain and sensitivity to cold and heat. Teeth can be broken by chewing foods such as nuts, hard candies, ice cubes, fingernails, biting pencils, or other objects. They can also damage the jaw joint; the lack of hygiene definitely helps in the fracture of the teeth. Gingivitis is inflammation of the tissues that cover the root of the teeth. The cause is the dental plaque product of inadequate hygiene, which reddens and inflames the gums, makes them bleed and causes bad breath. Periodontitis is an advanced form of gingivitis that can cause loss of teeth, painful abscesses, bad breath, bleeding and changes in the bite. The damage will be permanent if it is not treated in time. That’s why you need to start using these dental solutions and take are of your oral health. The use of the toothbrush is necessary a minimum of four times a day; especially when getting up and after every meal. Also when you consume foods with sugar. It is recommended not to rub the brush with force to avoid injuries or enamel wear. The circular movements are the best to ensure greater effectiveness. The most recommended toothpastes are those that include fluoride. This substance remineralizes the enamel and contributes to the elimination of the dental plaque, attacking the bacteria that produce it and that perforate the teeth until creating a decay. In the temporary absence of the brush, rinsing the mouth with water will help to reduce the effect of the bacteria. The habit of eating a green apple and then rinsing your mouth with water is another option. It is necessary to have an adequate oral hygiene. It is easy to floss those places in the mouth that the brush does not reach. Between the teeth accumulates remains of food that generate a dense plaque, very harmful for the dental health. There are three very simple methods to reach all corners:the thread, the interdental brushes or the oral irrigators. Any of them is ideal for this important task. The correct dental cleaning culminates with the use of mouth rinses. They finish cleaning those spaces that you cannot reach with a brush or other utensils. There are rinses with anti-caries effect, bleach or those that minimize sensitivity. At the same time, they give a pleasant sensation of freshness. Further info: Get Rid Of Tooth Decay Naturally Using This Homemade Remedy! Once a year (at least) we must visit the dentist. The expert will be alert to possible dental diseases, such as caries, gingivitis,periodontitis or tooth darkening, among other pathologies. Adequate dental hygiene should be complemented with visits to the dental clinic, where fluoride levels will be reinforced. In addition,deep cleanings will be done and ideal products will be recommended to achieve better hygiene. The contribution of calcium for a better dental training is achieved through food, in the first instance. Foods rich in vitamins and minerals should be part of the daily diet. Fish, vegetables and fruits are beneficial for the whole organism, including the mouth. Other foods such as sweets and sugar-rich beverages are highly detrimental to the teeth. Some, like coffee and wine, stain it. For its part, hard candies can cause tooth breakage. A correct oral hygiene will definitely contribute to dental and oral health in general. These 5 habits that help you take care of your oral health will guarantee a beautiful smile. This is the letter of introduction of a healthy and happy person. Don’t forget to SHARE these dental solutions for good oral health with your friends and family on your social networks!